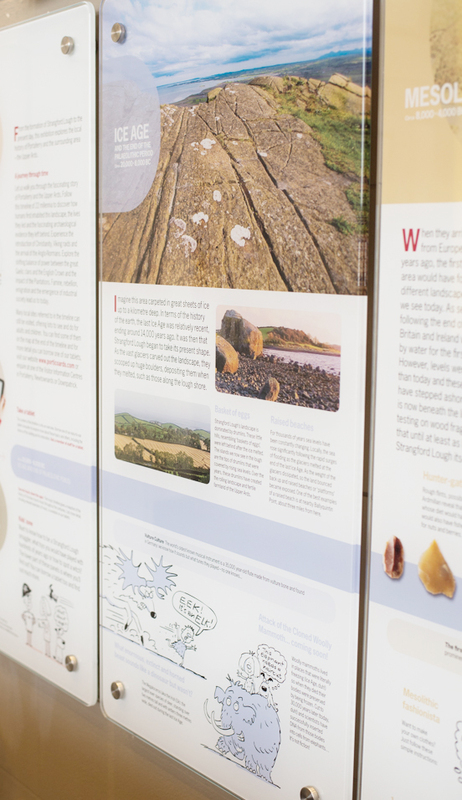 It's been several years since Atelier was commissioned to help the Friends of Portaferry Presbyterian Church (FPPC) rescue their crumbling meeting house. We helped FPPC to secure Heritage Lottery funding so that their building could be renovated and opened up to the local and wider community. 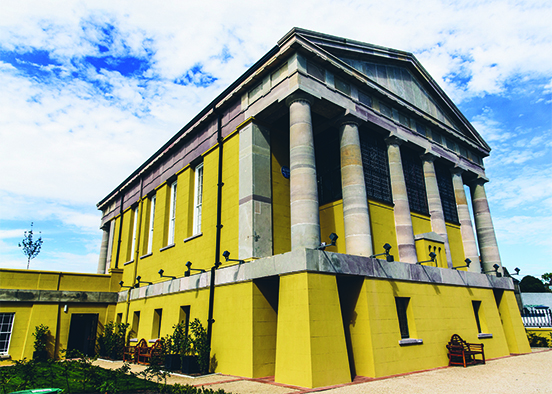 The Grade 1-listed building dates from 1841 and was modelled on the Temple of Nemesis in Greece — quite an unusual edifice for the small market town of Portaferry on the Ards Peninsula in Northern Ireland. 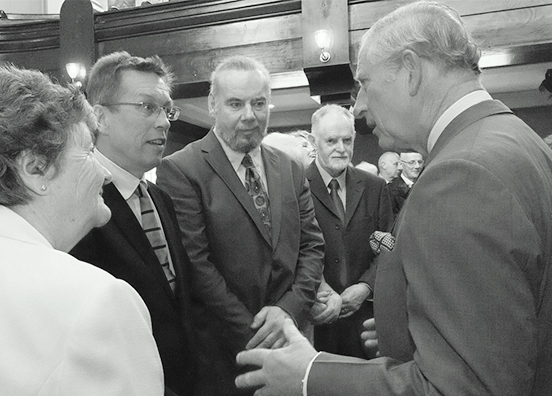 In May 2016, the Portico of Ards was opened and the Meeting House rededicated by Prince Charles, who described its transformation as "remarkable". After the service, His Royal Highness gave an address and then showed a keen interest in the building's classical architecture during a short tour. He seemed genuinely pleased to engage with the many volunteers who had helped bring the building back to life — including a startled Atelier partner. The same day also saw the unveiling of Portico's permanent exhibition, which runs for 12 meters along the wall of its upper gallery space. 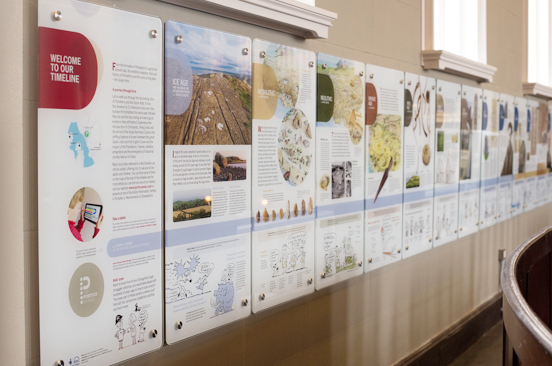 Designed by Atelier, it is a timeline covering the last 22,000 years of the Ards Peninsula's history. 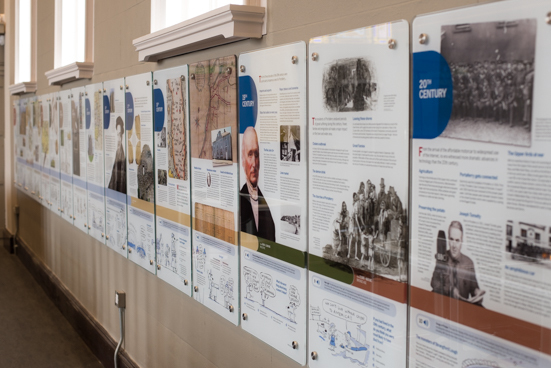 The exhibition was compiled by local historians, and we organised the content across a series of 19 wall-mounted glass panels. 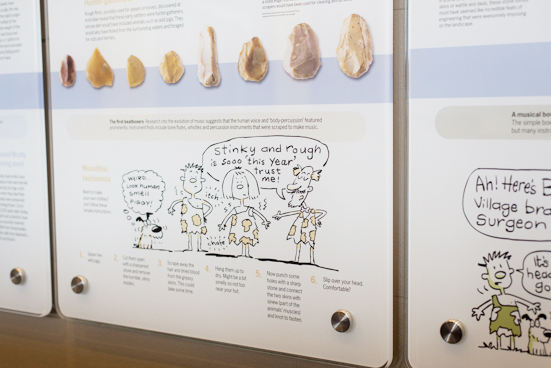 The exhibition represents an eclectic mix of geology, archaeology, local events and notable figures. The light but engaging narrative is well illustrated with images gleaned from local archives, artists and photographers. Young children have something to follow too. Below the timeline they will find a cartoon strip featuring a brother, sister and their clever pet dog. These three find themselves in very strange situations as they travel through the 22,000 years. 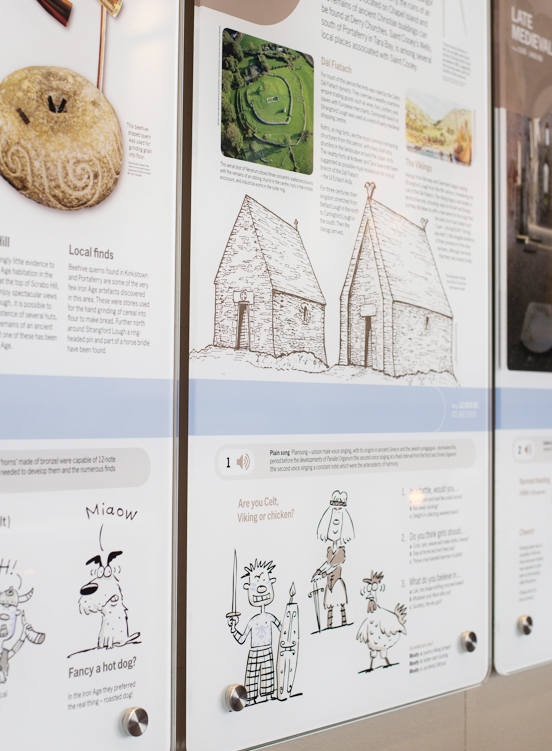 You can visit the Portico exhibition by clicking the icon below and then scrolling left and right. Better still, take a trip to Portico yourself and enjoy this really charming town.